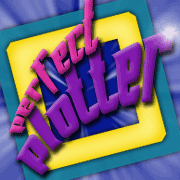 Pantzer or Plotter – A verdict? Before I started NaNoWriMo I explained how I wanted to use it to explore how I work as a writer; whether I work more efficiently from a detailed outline or just letting the story flow and evolve. In the summer, writing Inyana for Camp NaNoWriMo, with no plan at all, I managed 30,000. This November, working to a fairly detailed outline, I wrote just over 15,000 words on Mime. 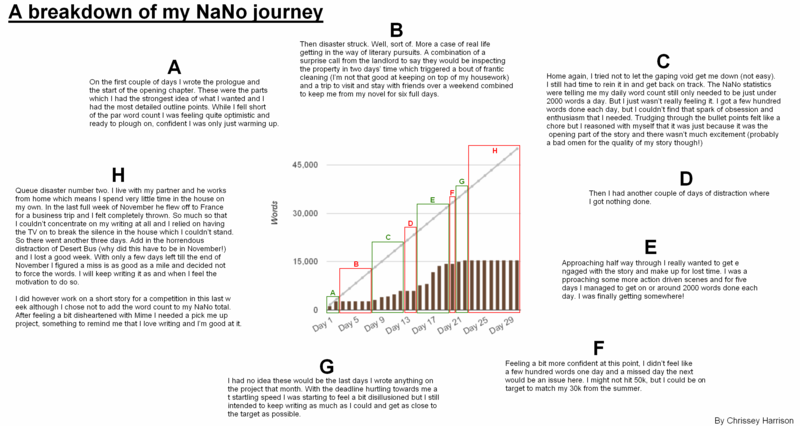 This seems like fairly conclusive evidence in its own right, but I want to take a longer look at how my NaNo month went. Distractions, disasters and setbacks aside, I have to admit that I didn’t fight for it. I didn’t get that feeling I’ve had before when I’ve written a lot in a short period of time where I wake up in the morning and all I want to do is write the next scene and the next and the next. The outline did not help in that respect. Writing felt less like exploration and more a matter of in painting. Okay, so the fleshing out brings the bare bones of the story to life, but it’s just not the same as watching it unfold under your fingers. What was worse, I found my creative instincts pulling me in different directions and I had to force myself to conform to the outline which felt counter intuitive and I expect may ultimately end up being counterproductive. Outlining seems to be a noble idea, but I don’t feel like I get on with it. It takes a lot of the fun and excitement out of writing for me. I think if I am going to use outlines I need to be loose and flexible with them; I need to leave myself room to explore, and if my creative instincts want to take the story in a different direction I need to adapt the outline to accommodate that. I rebel against deadlines. Right now, if I set myself a target I will procrastinate. I never used to have a problem with stress affecting my work output but it seems things have changed. I need to work on finding my drive and enthusiasm again. I write because I love writing. If I’m putting it off or avoiding it then something is wrong. I’ve had a lot of failures in my life these last couple of years and I’ve begun to forget that feeling of triumph that comes with meeting your goals. It’s no longer acting to motivate me and I need to work on getting that back. I need a reminder of how good it feels to succeed. I like the idea of planning, but I don’t like the practice. It seems the side of my personality that likes planning things is not the side that is a writer. I can see a place for planning in my work, but creating a detailed, intricate outline before I start writing is not it. I think the extra work in re-writing and editing a pantzed project, for me, outweighs the negative impacts of restricting myself to a detailed plan. Therefore I embrace my true nature as a pantzer. From now on, planning and outlining will be minimal or take place after the first draft. Great post, Chrissey. I’m definitely a pantzer. (Ha! LOVE the term.) My few attempts at outlining have worked against me, so instead I maintain a direction. I love looking discovering what happens as I write it. Also love that fact that different strokes work well for different writer-folk. 😉 Congrats on your important lesson learned! I am definitely a pantzer as well, looks like I am in good company. I have to say that I don’t think that there are any failures, these little set backs are just ways that you find that didn’t work. I really enjoy reading your blog posts, keep up the good work. I’m definitely a planning to a certain degree…although, I don’t bind myself to it if my creative instincts start pulling me in another direction. I try to plot out as much as I can so I know the basics of the plot…including the ending, and then I start to write. I find that if I don’t have some idea of where I’m going I run the risk of getting stuck too often. I don’t like to wait to “feel inspired” I like to get the work done and meet my quotas, which would not happen if I was relying on my “creativity” to take me places. I’m a plotter. I want to know before I write, where I’m going, who the characters are, and the basic plot hits. I wasn’t always that way but it’s what works for me now. Having said that, things do change sometimes as I write, then I go back to the plan/outline and change accordingly. Nothing is written in stone. Sounds like, with writing generally, you’ve been in a tough place through November. Having read some of your writing you’ve got a great imagination there, so I really hope you get your mojo back soon and feel inspired. My longer projects ground to a halt back in August, and I used flash fiction, and silly poetry to allow my creativity to keep moving, as well as trying to write things I’d never done before. It stopped me from feeling bogged down. PROUD pantzer – my self-reflection lasted til about the second paragraph to come to my conclusion. I keep to a schedule to try to maintain my blog sites but when it comes to creative writing I just wait until it sings to me. Sometimes (most) it’s around 3 a.m. when I can’t sleep, and my keyboard is just a few steps away. I will wear/post this badge with pride.